Washing your face with soaps or face wash is proved to be very bad for your skin. Soaps and facial cleansers contains harmful components which may effect on your skin for long period usage. In this pollution world, to get rid of dirt, oil, and grime from face, it is necessary to keep the skin healthy and glowing by washing. How can we keep our skin break free from chemical laden products? you would definitely need a more natural cleanser to take care of your skin. Worry not, cleaning your face without soap is actually as simple and healthy as it sounds. There are multiple ways of washing your facial skin clean without using products containing chemicals like soaps, face wash and face cleanser. Go ahead and start experimenting with non-soap ways to clean your face, try these natural cleansers easily available in your kitchen cabinet to make your skin glow naturally. Milk is not only supplies calcium for your bones, but it also makes wonders on skin as a cleanser. Lactic acid in milk works to remove dead skin cells, proteins and fat moisturize and plump the skin thus your skin looks more beautiful. Take small amount of whole fat milk into your palm and gently massage into your skin. You can also mix 2-4 cups of milk to your bath to get head to toe nourishment and cleansing effect. As a breakfast we all know how best and effective option is Oatmeal, but it is also acts as a natural exfoliator, the soft oatmeal when massaged on the skin gently exfoliates it. It is one of the best natural cleansers hiding in your kitchen. Grind half cup whole oats and store it in a tight container. Whenever you wish to use, mix it with a water, oil or aloe vera to make a paste and massage into your skin and rinse with warm water and pat dry with a soft towel. You can also add mix wheat germ, cornmeal or rice powder to the oatmeal mix before cleansing your face. Wash your face with cucumber juice or its pulp. It keeps your skin moist, hydrated and supple by its mild and cooling effect. Cucumber is perfect to use on sensitive and dry skin. 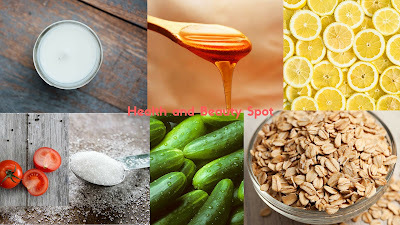 Apply it on your face twice or thrice a week and it will transform your skin, giving it a healthy, happy glow. Lemons are an excellent natural cleanser for oily skin and make you look younger. You can mix lemon juice with milk or yogurt for a rich cleanser and apply the juice after you cleanse for a non-scrubbing exfoliator. You can even apply fresh lemon juice directly to your skin, let it absorb and then moisturize. It sounds like it would sting or make your skin dry but it actually feels quite refreshing – just don’t get it in your eyes! Sugar can also gently clean and cleanse your skin but make sure you use a finely grounded sugar that won’t be too harsh for your face. Mix sugar with a small amount of water or oil to make a paste. Now gently massage into your face even body, if you like then wash.
Start using honey to your skin on a regular basis and it makes you feel wow and amazing. Being a natural humectant, it cleanses your skin. Honey is packed with antibacterial properties that has amazing healing power that can help with irritated skin and reduce redness. Just apply directly to your face and leave it for until you feel the sticky, you can wash it off with chilled water. Use it twice a week and feel the natural glow! Tomatoes works great for your skin, as they have cooling and astringent properties. Tomatoes are high in vitamin C and vitamin A, which can eliminate acne and brighten the skin. It is naturally acidic, so it helps balance the skin and get rid of excessive oil. Take one tomato cut into two pieces, take half piece and pour little sugar on it, let the piece absorb sugar. Now rub your face gently with the tomato slice in a circular motion. Leave if it for 15 min and rinse with water.